Sugar had been shown extensively from the time she was 3 years old until she was 10 years old. 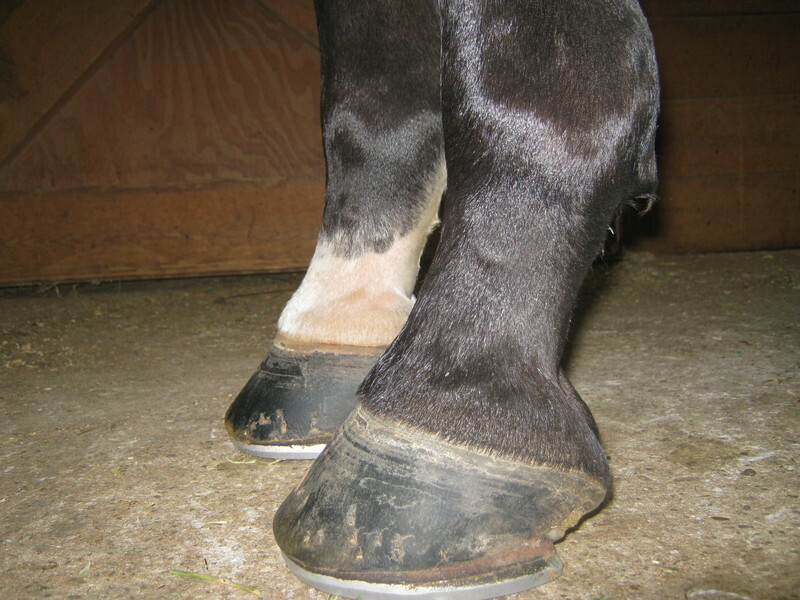 At 8 years of age Sugar developed lameness due to Navicular Syndrome. At 10 years of age Sugar was retired and turned out to pasture. At 12 years old Sugar was unretired and had been showing for 6 months without lameness. Two days before the biggest show of the year Sugar developed acute lameness in the Right Front limb. Sugar presented with grade 2 lameness in the RF limb. There was neither heat nor swelling in the limb. 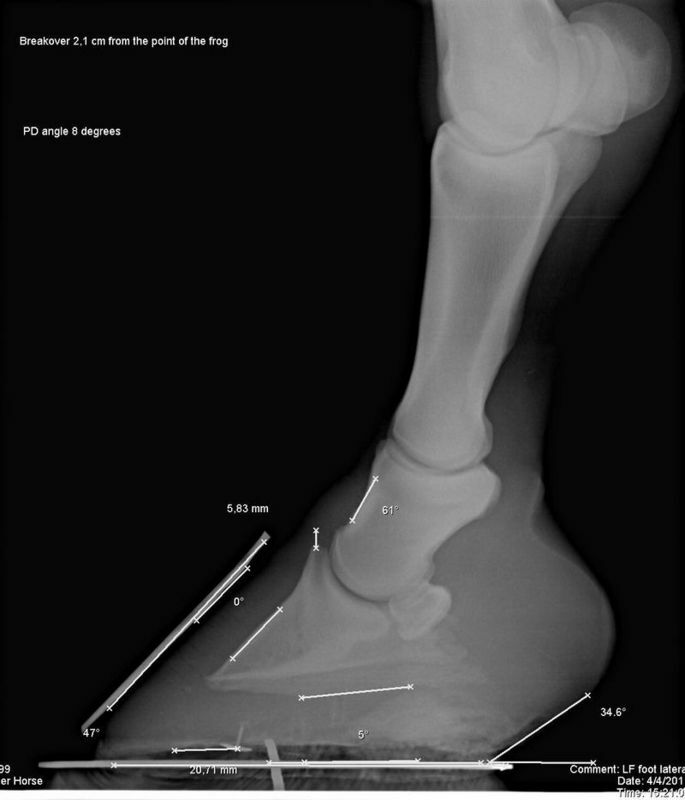 She was negative to hooftesters, fetlock flexion, carpal flexion, and reverse wedge tests. Sugar was carrying 83 lbs/in2 on both front feet. The lameness was 100% improved following a palmar digital diagnostic nerve block of the RF foot. 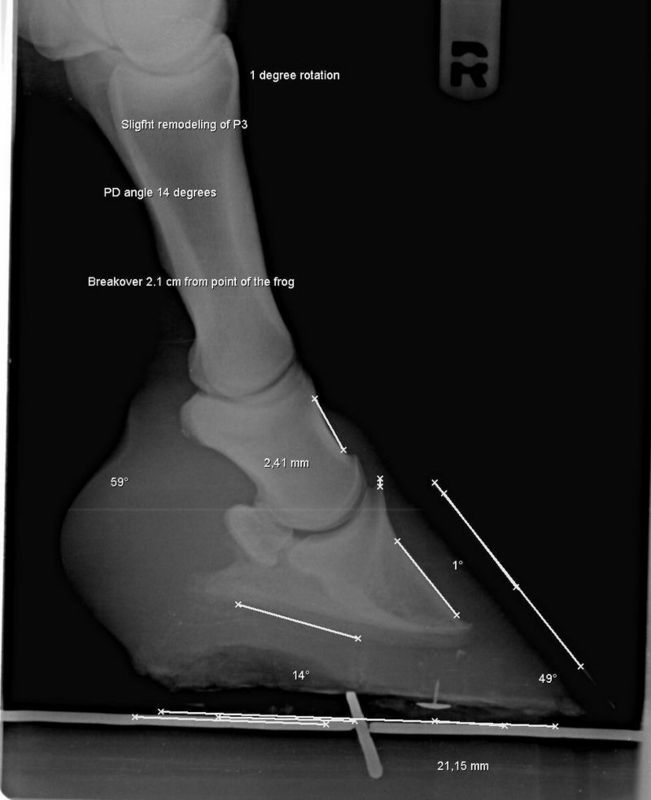 Diagnosis: lameness in the back half of the RF foot - Navicular Syndrome. 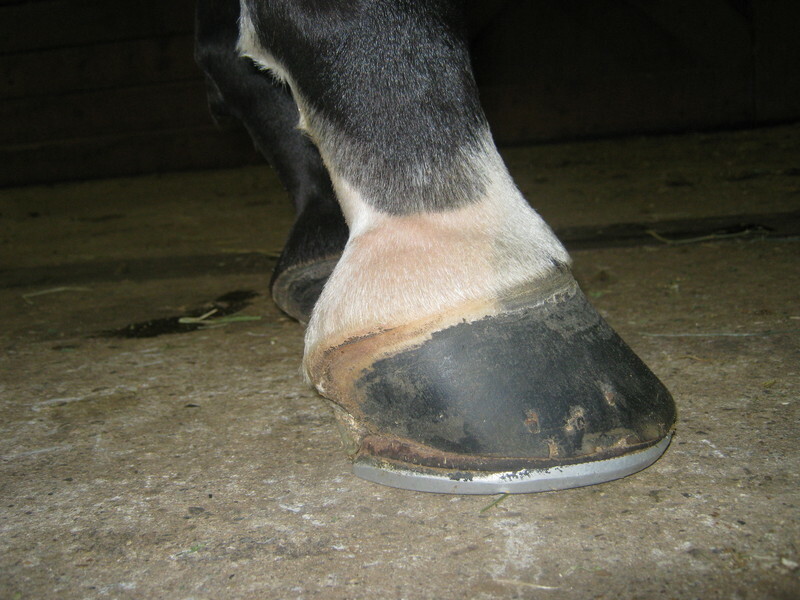 Follow link for more information about diagnosis and treatment options of navicular syndrome. We injected bee venom over the palmar digital nerves. Bee venom acts to chemically ablate or numb the nerves so that Sugar could not feel the pain in the heel as well. Sugar was started on the non-steroidal anti-inflammatory drug Firocoxib. Sugar presented to the hospital to continue treatment. After chemical ablation and performance shoeing her lameness was 75% improved. Sugar was treated with tildronic acid intravenously. Tildronic acid prevents the breakdown of navicular bone (osteolysis) over the navicular bursa and where ligaments attach to bone. Follow link for more information on tildronic acid . Sugar was also treated with shock wave therapy into the deep digital flexor tendon, the navicular bursa, the impar ligament, the navicular bone, and the palmar digital nerves. Shock wave helps healing by causing cells to divide faster thus the lesion heals faster. Shock wave also helps with pain control by temporarily demyelinating the nerves. Click link for more information on shock wave therapy. Sugar traveled to the horse show approximately three hours on a trailer. Sugar showed without pain and competed well. In fact she went on to show over the next 8 days without pain. I have re-examined Sugar on many occasions and she remains pain free. Due to time constraint we used a "throw in the kitchen sink" approach to treatment of this lameness. Keep in mind that we only had two days to get Sugar sound, and that she could not miss the most important show of the year. On most horses with Navicular Syndrome we use a more systematic approach; however we will go to the "throw in the kitchen sink" approach at the owner's request.